I have a three-year-old daughter who thinks she is Miss Independent. She doesn't take punishments seriously, and I feel like I'm always telling her not to do something. Something needs to change. I tell her when she is a good girl that she is awesome and give her great praise...then I fall victim to bribery. The "if you are good, we'll go to the store to get you a surprise!" Yeeeah...so that has back-fired on me on now and created a spoiled monster some most days. Now that I'm home with her all day, and have started in-home daycare I was looking for a new way to reward good behavior. I'm tired of hearing "she pushed me" "she pinched me" "NO! that's mine" so on and so forth. Thinking long and hard about it I decided to start a Reward Box. The box is full of simple candy, toys and trinkets that the kids think are amazing. I shopped at the Dollar Tree to get it started (I'll list the contents and everything a bit later). 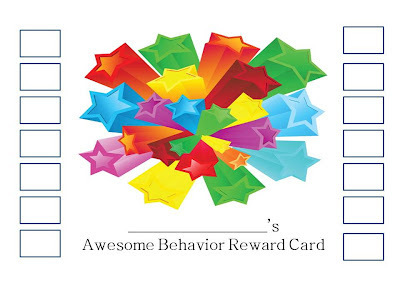 So I came up with the Reward Box, but I needed a structured way for the kids to earn the rewards. The idea came to me as I was at the local Starbucks and gave them my loyalty punch card. A punch card. That is the answer. I put some time and thought into the amount of good punches the kids need to earn a reward. I didn't want to make it too easy, or too difficult. So simple things (suckers, play-doh, stickers) are the lowest "price" at 3 punches each. Next are a little better prizes (playing cards, spin tops, bubbles) at 7 punches each. Then the BIG reward items (books, plush toy, balls) are 14 punches each. You can work out the finer details, but bigger rewards can be equal to 2 or 3 smaller rewards. I purchased the 3 color dot stickers from Walmart that is frequently used for garage sales to color code the rewards. Then I made a sign and mod-podged it to the front of the box so the kids (and I) knew the value of each reward in the box. I then created a simple punch card that I can write in the child's name and either punch out the boxes with a paper punch, check it off or put a sticker in. However you prefer. I put a total of 14 boxes so I could easily keep track when it gets full so earning a large reward from the box. Then I got to thinking about rewarding the 2 girls that are potty training about using the toilet. My own daughter gets lazy by the end of the day and won't stop playing to go, and the other girl is just starting to learn how to go on the potty. 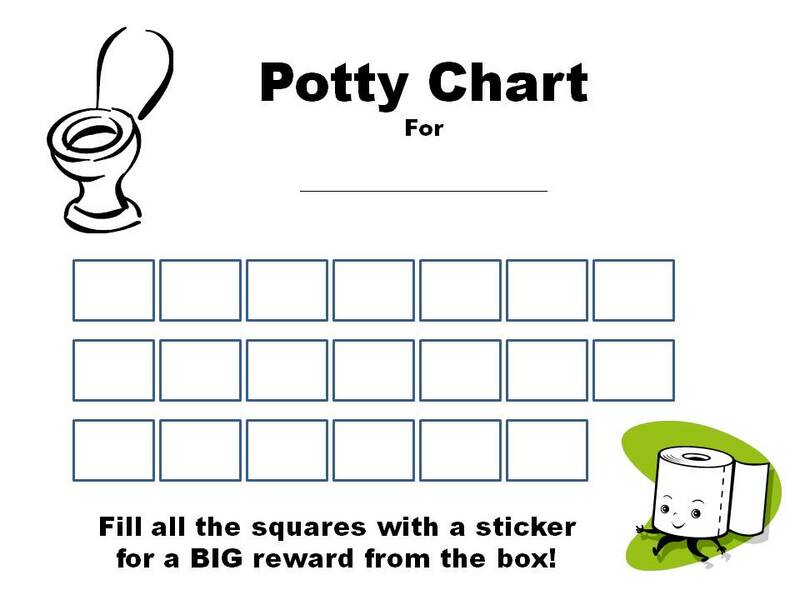 Thus the creation of a potty reward chart! The same idea applies, I added 20 boxes, and they get 1 sticker for #1 and 2 stickers for #2 (makes sense, right?) When all 20 boxes get filled with a sticker, the child earns a BIG reward from the box. (The 14 punch worthy item). I picked up a flower paper punch for 97 cents in the scrapbook aisle at Walmart, and at the Dollar Tree I picked up a teacher's sticker book that has 400+ little reward stickers...stars, trophies, etc. The design doesn't matter to the girls so much, just the fact that it is a sticker and they want it! But they are small enough to fit into the potty chart boxes. So far so good! The girls are working hard to get punches on their card. I keep them pinned to a cork board so everyone can see them, including parents during drop off and pick up times. 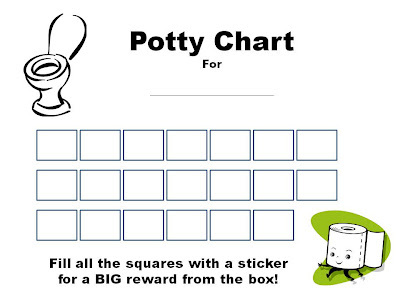 The potty charts are taped to the bathroom door so the sticker is given right then and there. It is fun to watch them get so excited about being good and doing good things! To get it started I just walked around the Dollar Tree and picked up random items. The ideas keep flowing on what to put in it. I found that party supplies work great because you can get a lot of an item at minimal cost, and kids tend to want the same toy otherwise a fight or pouting begins. You get the idea. So many things could get added. Juice boxes, coloring books, even cards for redeeming things like "15 minutes extra computer time" or things like that. Whatever your children enjoy! What do the children get punches for? good behavior? I work in a preschool and am trying to figure out how this would work on a daily basis? do they get in the reward bucket daily or on Friday? weekly one will be great.. we can give the kids a card each week.. and Sunday Mornings could be their reward day... great idea... thanks!!! My daughter is almost 2 and have been slowly introducing the potty. First, we just bought the little potty (1 for upstairs, 1 for down) and we just had her get used to seeing it in the house. We then encouraged her to sit on the potty (clothes and diapers on) and she is now comfortable to sit on the potty for 10 minutes or so. Then came our summer vacation and we took a break from it. As soon as we came home, I have been taking her diaper off so she can try to go and she has popped on the potty the last two days. Still no pee though.